In his meeting with Mayor Levar Stoney this week, former New Orleans Mayor Mitch Landrieu challenged Richmonders to consider the continued impact of Confederate monuments on our city’s image and reputation. 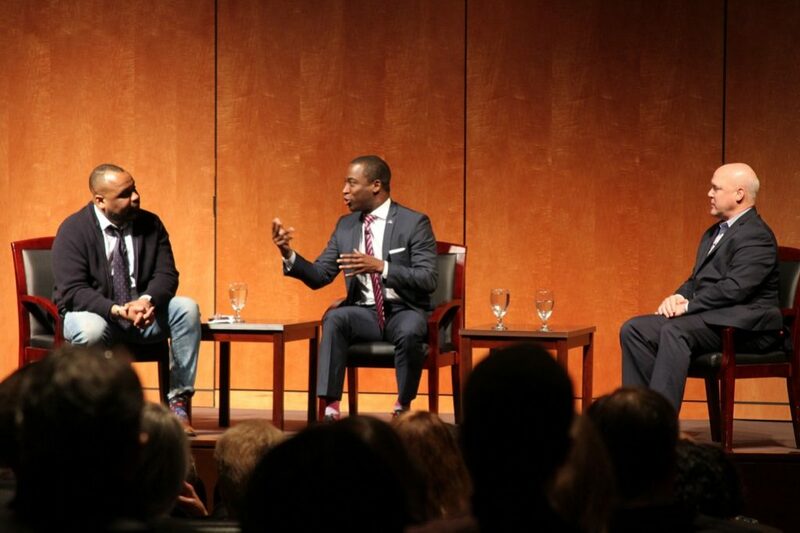 It was a meeting of the Mayoral minds on Tuesday, as Richmond’s Mayor Levar Stoney and New Orleans’ former mayor Mitch Landrieu engaged in thoughtful discussion at the Virginia Museum of History and Culture. 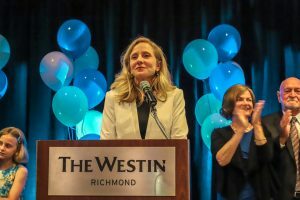 About 100 people listened as Mayor Stoney recounted Richmond’s struggle with Confederate iconography and race relations in Richmond, while Landrieu recalled his experience presiding over the removal of his city’s Confederate monuments. At the crux of this discussion, Landrieu asked of Richmond: What do we want to be known for? In 2015, Landrieu called for the removal from prominent public display of four monuments in New Orleans, three of Confederate generals and one memorializing a violent coup of the state government by the Crescent City White League. All the monuments in question were removed by May 2017, although not without two years of legal battles, public criticism, and even threats against Landrieu’s life. His opponents criticized him for a lack of transparency during the process. In a discussion moderated by Julian Hayter, an associate professor of Leadership Studies at the University of Richmond and member of Stoney’s Monument Avenue Commission, Stoney and Landrieu discussed racism in the South, and how to reconcile its history with its people. “We can’t ignore the fact that we’ve had an ugly history,” Stoney said. Last year, Stoney’s Monument Avenue Commission recommended removing the Jefferson Davis monument, while adding context to the other four Confederate statues. Landrieu’s charismatic, animated oration offered blunt, third-party observations about Richmond’s race relations and Confederate iconography. Ultimately, he posited Richmond must find a solution that is right for Richmond, regardless of any other city’s actions. Stoney stated that if it were in his legal power to remove them, the statues would be gone. He also said that while removing the statues were important to many Richmonders, his real concern was providing reparations to deprived communities negatively affected by past racial injustices. In this context, reparations are not about putting cash directly in the hands of disenfranchised people; they are about funding schools that never get funded, putting money in parks and community spaces, and reforming previously exclusive places into safe, inclusive space. They are about allowing a city’s architecture, aesthetic, art, and monuments to reflect the citizens it houses. 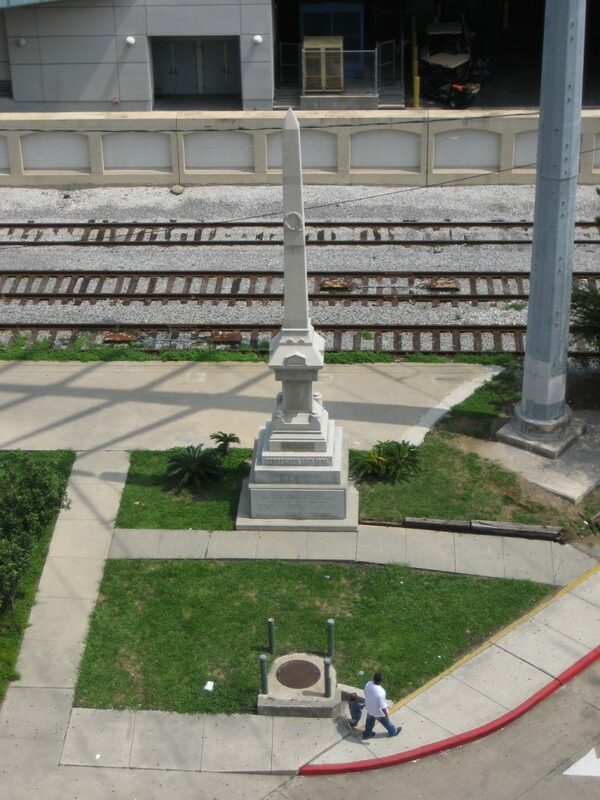 Landrieu urged Richmonders to consider that a single plaque is not contextualization. To provide an adequate frame of reference would require the statue of a “lynched man” to reside next to Jackson and Lee. It may be prudent to point out that by erecting those statues, we are actually disobeying the wishes of a dead man, one who is at the epicenter of this entire debate: Robert E. Lee. After the Civil War, Lee swore allegiance to the Union, publicly denounced any sentiment toward Southern separatism, affirmed the need to move on, and believed that by keeping those images alive, so would the sentiments of division live on and thrive. Mayor Landrieu asserted similar sentiments in asking us to question that reverence associated with Confederate iconography. We have an entire avenue on which we all but worship the leaders of a failed nation, then act as if this is a presentation of historical events rather than a deep respect and longing for that failed nation. America has a history of building grandiose, reverent monuments to what Lee described as “civil strife,” and compared to those left by other countries throughout the 20th century after their own national conflicts, it calls us to examine how Americans display memorials to bloodshed. Our memorial to the lives lost in the 9/11 attacks has turned into a multibillion dollar shopping mall, the Westfield World Trade Center. 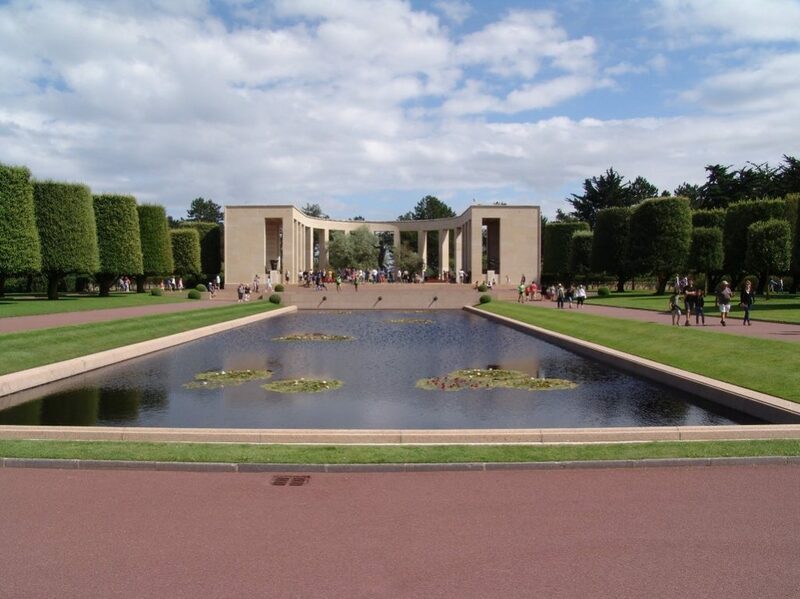 The American cemetery in Normandy, France, honoring those soldiers lost to WWII, boasts a $30 million welcome center, a chapel, and a 22-foot statue. Compared to the somber, understated French, German, and Canadian cemeteries in the same area, America’s message is clear: We are dominant, we are proud, we are strong, we are to be seen. And while direct, this isn’t entirely inappropriate. Our culture differs from European countries in that we are opportunistic, and have a free-market capitalist economy. We honor our tragedies, but we simultaneously find a way to make money from them. We are clever, competitive, and fierce. Albeit occasionally sporting a tone-deaf quality, it is true to our nature. For better or worse, it is what we are known for. And, ultimately, even the aforementioned monuments honor soldiers and innocent lives lost to tragedy and terror, rather than the lost cause for continued human oppression that the figures on Monument Avenue commemorate. And so, Mayor Landrieu’s challenge to Richmond resonates. In the wake of his visit, we must ask ourselves the same question he asked of us: What do you want to be known for? And how will you display it? 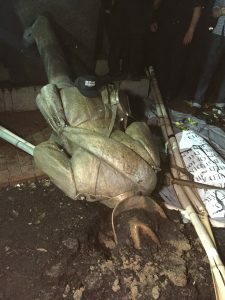 Students at the University of North Carolina in Chapel Hill toppled the Confederate monument known as “Silent Sam” on Monday night. According to WRAL, nearly 200 student protestors assembled at the Peace and Justice Plaza at around 7 p.m. to call for removal of the statue. 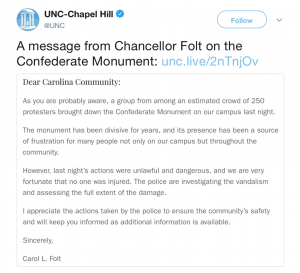 A short time later they marched to the statue, and by 9:30 p.m. it lay on the ground, toppled, while the crowd of students erupted in a raucous applause. 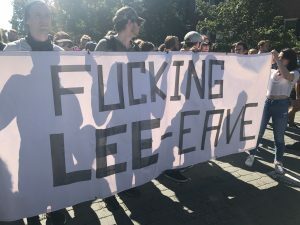 Monday’s protest began as a march for solidarity with Maya Little, a graduate student who was arrested this past spring after defacing the statue. In addition to criminal charges, Little also faces an honor court that could lead to her being expelled from the university. This comes at a time when cities and institutions throughout the south are grappling with what role statues and symbols glorifying the Confederacy and spreading the Lost Cause myth should have in public spaces. Like Richmond, Lebanon’s capital city Beirut is still grappling with the legacy of civil war. Unlike those in Richmond, though, many of Beirut’s current residents lived through the most recent civil war, which lasted from 1975 to 1990. The political structure that exacerbated the tensions of the war still exists. Lebanon’s 18 official sect affiliations organize political representation, access to government services, and much of social life, largely as they did before the war. Debates about reconciliation and commemoration co-exist with immediate concerns about ongoing rebuilding and preservation efforts, contemporary politics, and even, for some families, with lingering questions about the disappearance of loved ones. As a result, the attempt to identify some sort of collective memory is fraught. The International Center for Transitional Justice notes that, “The civil war is not documented in school history books, and young people are often actively discouraged from discussing it in school.” I heard this concern echoed by friends and fellow educators in Beirut and ascribed to the difficulty of politicians’ and community leaders’ coming to narrative consensus about the war. Without a shared academic curriculum or national narrative commemorating the war, Beirut’s artists and designers play a key role in visualizing memory and linking their history with the present. My time in Lebanon last month coincided with the seventh annual Beirut Design Week. The program, which ran from June 22 through 29, showcased the work of local artists, designers, writers, and activists. Begun in 2012, Beirut Design Week (BDW) now offers more than 150 exhibits, lectures, temporary public art pop ups and performances, and interactive community events, drawing at least 25,000 visitors per year, according to the organizers’ calculations. While BDW exhibits explored a range of topics, the war’s legacy echoed throughout artists’ work and even through the exhibition sites themselves. The exhibits I attended cautioned against both remaining beholden to and ignoring history. Instead, they looked for ways that design and public art could mediate between the past and present. 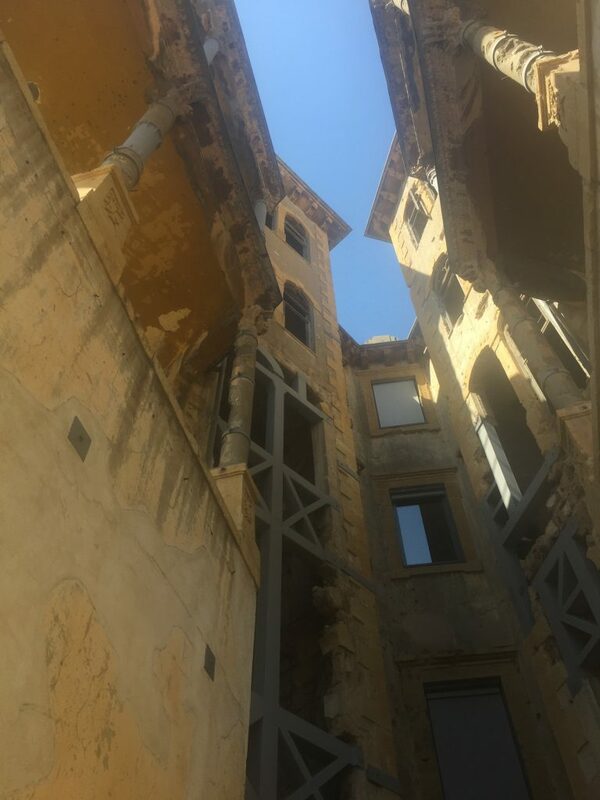 In their introduction to the exhibit, they argued that Beirut has been negatively impacted by “the boom of foreign gentrification” in which developers from outside Beirut rebuild without considering the city’s culture and history. The Beirut Souks, for example, once the site of local trade in fabrics, spices, and other goods, now more closely resemble Short Pump. 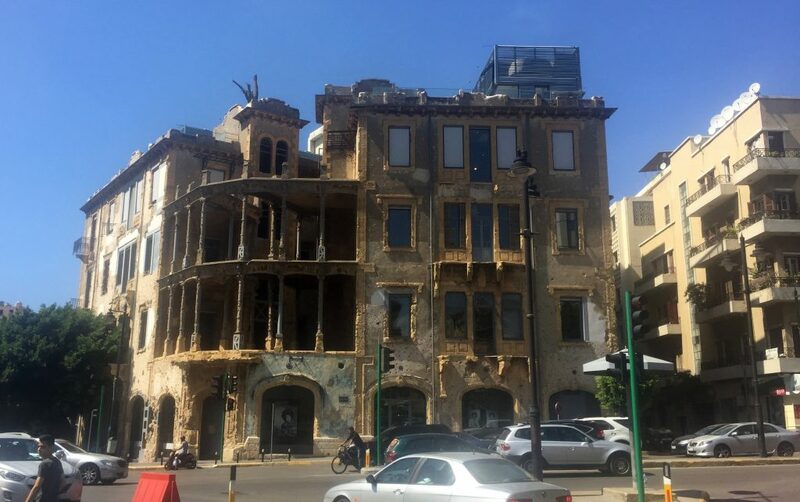 The renovation was spearheaded by a private real estate company called Solidere, which came under fire for its connections to the Hariri family (Rafik Hariri was a former prime minister of Lebanon who was assassinated in 2005; his son Saad currently holds the same position) and its willful erasure of civil war history in Beirut’s downtown. To challenge that kind of development, Architects for Change turned Zico House into a space visibly flooded by memory. 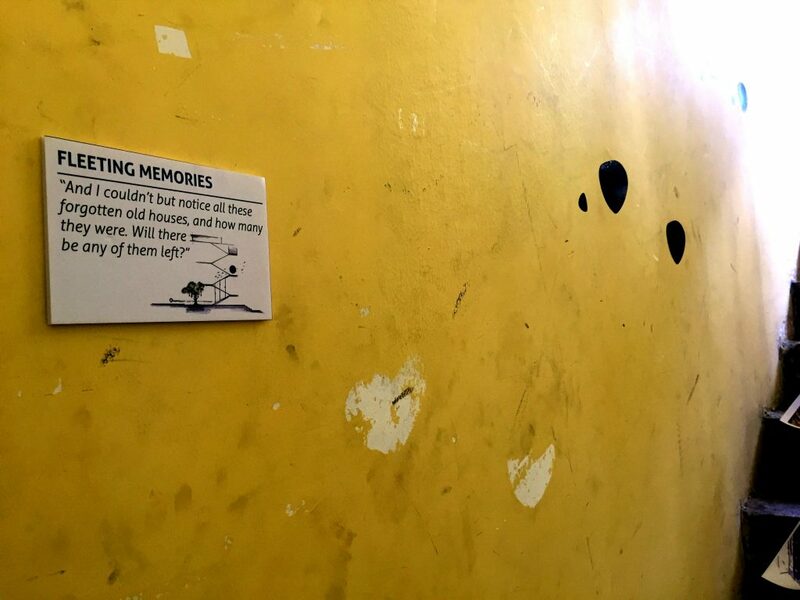 Artists created an imagined former resident of the house, a young boy whose recollections of home—“the rubber tree roots that broke through our tiles and became part of our house,” for example—were written on walls and hung from trees. 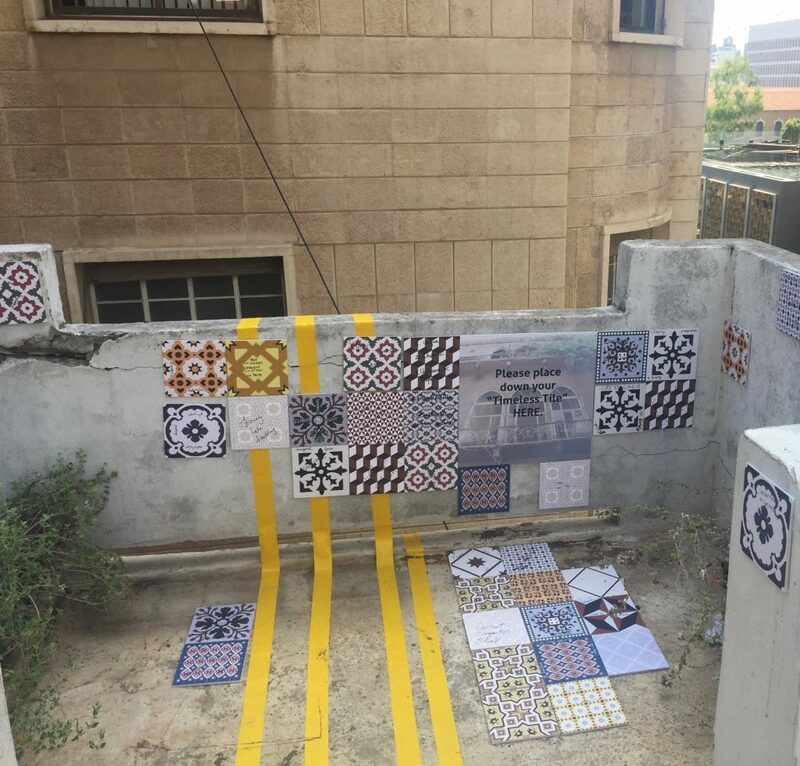 As visitors wound their way up Zico’s steep stairwell, they were invited to describe their own feelings about Beirut’s past, present, and future in a single word on tiles which were then added to a rooftop mosaic (one respondent’s three answers: “Raw, tragic, fragile”). Once on the rooftop, signs marked the former locations of buildings that were since demolished by war or by rebuilding, as cranes and constructions workers labored across the street. Before the war, Beit Beirut, another BDW site, functioned as the Barakat House does now. It was designed by Lebanese architect Youssef Afandi Aftimos in 1924. Because of the building’s position on the dividing line between East and West Beirut, it became a sniper post and saw heavy fighting. Today, Beit Beirut’s façade is pockmarked with bullet holes and worn down by fire. The casual observer might assume that she’s looking at a condemned building. Inside, though, new metal supports bolster the structure, the paint is fresh, and renovators have installed a modern auditorium and office spaces. 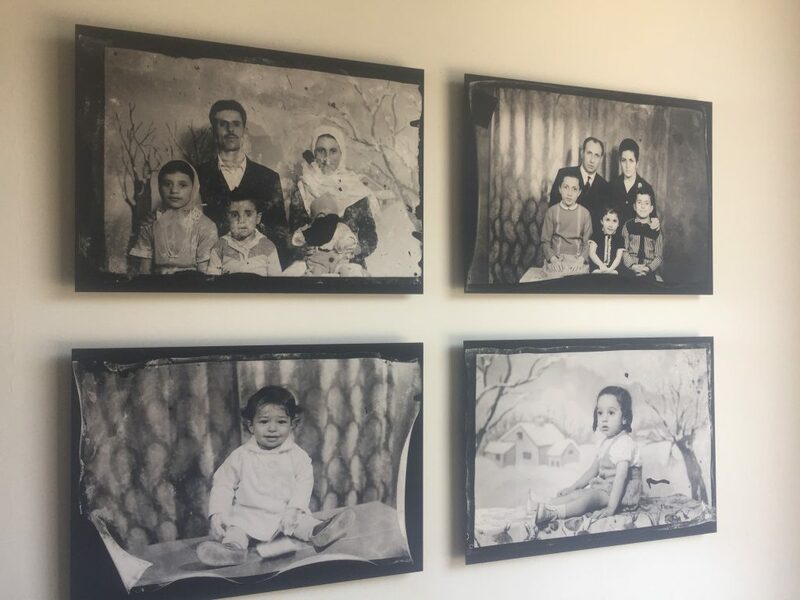 On the ground floor of Beit Beirut, a permanent exhibit describes the former photography business, Photo Mario, that was located at this address before the war. Curator Mona El Hallak describes the project as essential to Beit Beirut’s efforts as a “Museum of Memory.” Negatives and images uncovered from the debris after the war hang from the walls. Additional boxes of photos encourage viewers to pick one and attempt to locate the person in the image, drawing the audience into the work of reconciliation. Richmond and Beirut are nowhere close to identical cities, and what works for Beirut as it continues working toward a future that engages a legacy of violence and deep divide will not necessarily be true for Richmond. But with the Monument Avenue Commission Report’s recent emphasis on partnering with the local arts community to envision new possibilities for commemoration in Richmond, Beirut Design Week is a useful reminder that the work of navigating the past and envisioning the future should be creative, intentional, collaborative, a bit messy, and always open to the public. *This article was made possible in part by support from the VCU Global Education Office. After a long, heated debate, change became the chosen path for Richmond today. According to the Monument Avenue Commission, Richmond Mayor Levar Stoney officially recommended the removal of the Jefferson Davis Monument today from Monument Avenue. “Of all the statues, this one is most unabashedly Lost Cause [sic] in its design and sentiment,” the commissioners wrote in the report. 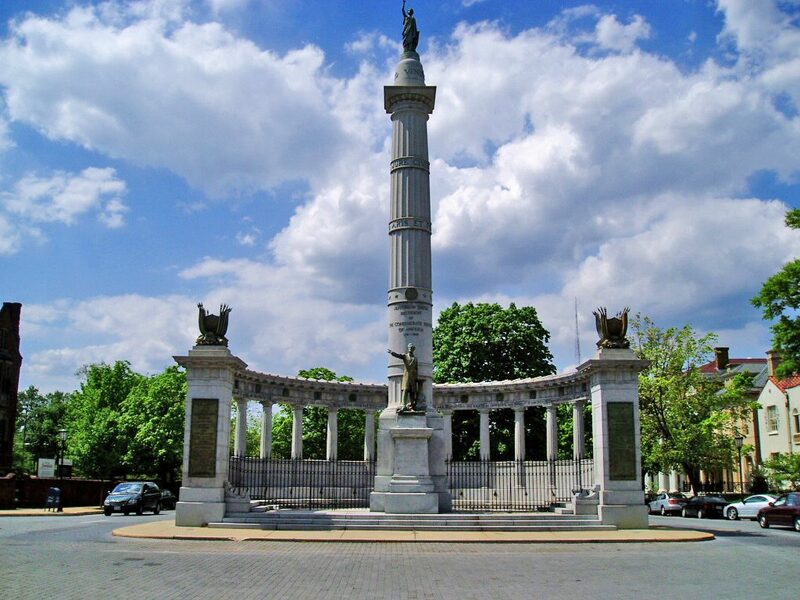 The board includes Christy Coleman, CEO of the American Civil War Museum, and Sarah Driggs, author of “Richmond’s Monument Avenue,” among others who look to direct the River City away from the ‘lost cause’ narrative many of these monuments represent. And with these monuments having origins in the Confederate ‘lost cause’ mythology and Unite The Right 2.0 coming up in August, the commission came as a much needed response for these controversial monuments. After nearly one year of intensive study by the ten person commission, the group produced a 117 page report considering the future of Richmond’s Confederate statues, opening the floor to options including removal or relocation of the Confederate statues into a museum, or somewhere with proper context. The yearlong review examining the statues originally created to “determine how best to reconcile a particular landscape viewed as both sacred and profane,” is now figuring that for many of the statues, removal is the best option. Riding off the recent change to the Barack Obama Elementary school last month, this is the first of many necessary reforms to a city that has never truly healed. The report also addresses the monuments of Confederate Gens. Robert E. Lee, J.E.B. Stuart and Stonewall Jackson, President of the Confederacy Jefferson Davis and Confederate commander Matthew Fontaine Maury with short term changes that will add context to the statues, such as proper signage. They will also consider the opening or expansion into a museum exhibit, where the monuments may be put into proper context that reflects the newly inclusive historical significance the city wants to promote. 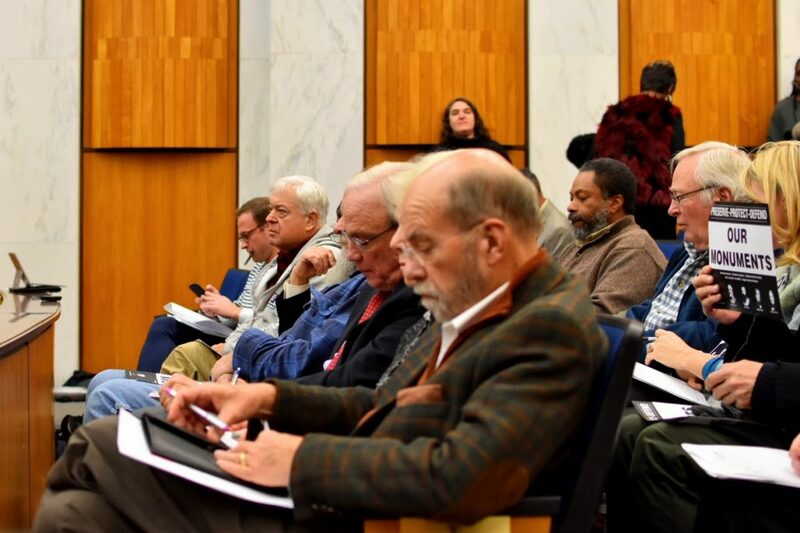 Last night, Richmond City Council voted 6-2 against a proposal requesting the General Assembly of Virginia grant the City Council the authority to remove of Confederate memorials on Monument Avenue. “There’s an African proverb, when lions learn to write, the hunter is no longer a hero. Well, if slaves would have had a pen, the history would be different,” Jones said. He was anticipating some of the arguments that would be raised by people opposing his proposal, which he described as a vote on right versus wrong. 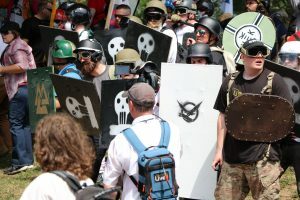 These were themes he returned to in a speech introducing the measure, invoking civil rights and Charlottesville, while proactively addressing opposing views. He noted that he’d been receiving death threats against himself and his children and even angry phone calls from a colleague on Council, which he described as unprofessional and borderline threatening. Opponents took turns speaking in three-minute slots, and they cited tourism dollars along with popular support, and many echoed claims of the Lost Cause narrative, a well-known historical myth that re-casts General Robert E. Lee and Jefferson Davis as heroes pulled into a war they didn’t want to fight – many sought to minimize the role of slavery. “The Confederate Congress had a Jew and an Indian,” Ron Moore said. He used the two racial slurs to argue that the presence of Judah P. Benjamin and Stand Watie, a Cherokee who formed the Southern Cherokee Nation, meant that the Confederacy couldn’t be racist. Another opponent, Helen Marie Taylor, introduced herself as a 94-year-old with a long history working to preserve Monument Avenue. She first focused on Jones, telling him to be “more grateful” for the monuments, which she says were built to facilitate a better union. After she was reminded that she can’t directly address an individual councilmember, she turned back to Council President Chris Hilbert to compare Jones to an arsonist. Another speaker, Ned Ruffing, described the city as a living museum and said he only learned about Gabriel Prosser, who led a failed rebellion to escape slavery, from a stencil someone had done by the Davis Monument. Earl Brantley spoke in support of the proposal, noting the limitations of the proposal and the history of disenfranchising African-American voters. Many of the 13 proponents echoed similar comments as Jones and Brantley, covering the history of discrimination and oppression in Richmond and beyond, including slavery, Jim Crow, and highway projects that bulldozed African-American neighborhoods. Omari Kadaffi, a local activist on housing and food issues, said he was moved to speak by seeing people of color who opposed the proposal. Phil Wylato, editor of the Virginia Defender newspaper was supportive, but critical of the measure. Pointing to opponents of the proposal, former City Council member Marty Jewell noted he was friends with some of them. “They’re not racist people to my knowledge, but they’re misguided people. 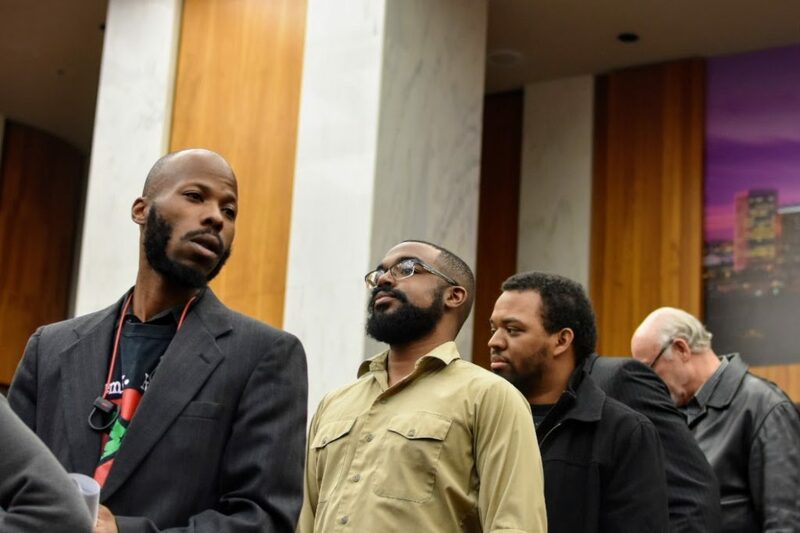 I’ve read the same textbooks they read in school, which said that black folks liked slavery, that we were ‘a happy lot’.” He spoke on the history of racism in Richmond before urging the Council to vote up the measure. After public commentary, city council spoke, many citing the Monument Avenue Commission as a reason to delay the vote. Although Council Member Ellen Robertson echoed many of her colleagues on the importance of dialogue, she came out in support of the proposal. “I want to support Mr. Jones in his courage and determination to move forward, and I also want to set the plate, so that when we do have this conversation, we won’t be like Charlottesville and say we can’t do anything anyway,” Robertson said. Charlottesville voted to remove their statues only to discover that state law prohibited their removal. “Council President Hilbert said he’d vote no, but used his remarks to criticize the Lost Cause narrative, and tied the building of the statues directly to Jim Crow and the Ku Klux Klan. Jones was given one last chance to speak before the vote. Among his comments, he expressed support for the Monument Avenue Commission, too, and described his proposal as part of that support. “If we choose to wait for the Commission, we’ll only be back here again, if they decide to add context or take them down,” he said. Robertson and Jones voted yes with Vice President Cynthia Newbille abstaining, and all other commissioners voting no.